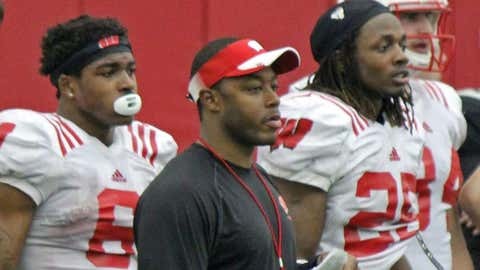 New Wisconsin running backs coach Thomas Brown (center) plans to shore up a couple problem areas with the Badgers' top running backs, like receiving and pass-blocking. MADISON, Wis. — Thomas Brown never could control his short stature on the football field. At 5-foot-8, he paled in comparison to the burly defensive linemen and linebackers he tried to outrun. But what Brown could control was his energy and effort at running back. And he used those skills to earn a freshman All-SEC selection and rush for 2,646 career yards during his college career at the University of Georgia. Despite those accolades, he was fearless and willing to do the little things to help his team, even if it meant picking up blitzes from players that outweighed him by 100 pounds. "Not to be arrogant, but I would dare you to try to run up on me," Brown said. "I had a physical mindset. I was the guy who tried to build my body up to be a tank." Those are among the lessons Brown hopes to impart on Wisconsin’s talented running back group. Brown, hired Feb. 24 to replace Thomas Hammock, is the Badgers’ newest coach. And though he has limited coaching experience at age 27, he believes his experiences as a player will serve him well. The two elements that drive Brown crazy? Lack of effort and physicality. "I hate guys who loaf," Brown said. "It takes no amount of talent to finish hard and go hard. You have so many limited opportunities in this game as it is, which I know first-hand. You never know when it’s going to be your last play. So you’d rather make sure you make the most of it. This is a physical game. It’s a physical position. I can’t really stand guys who are soft. Thankfully, we don’t have those guys here or we would have an issue. But that’s kind of my biggest pet peeve." Brown comes to Wisconsin after spending last season as the running backs coach at Marshall. One year earlier, he held the same position at Chattanooga. He said Badgers offensive coordinator Andy Ludwig first reached out to him, essentially out of nowhere, on a Thursday in February. Two days later, he was on a plane to Madison to interview for the job and impressed coaches with his professionalism and proven ability to build relationships with players. "He’s a high-energy, intelligent guy," Ludwig said. "Cares a lot about the players. Very good recruiter. He’s a great addition to the offensive staff." Wisconsin might not hold any official title as "Running Back U," but the Badgers’ backfield success over the years carries national relevance. Brown had seen those players from afar — and even played against Wisconsin in the 2005 Outback Bowl while at Georgia — and couldn’t believe his good fortune in landing the job at one of the premier position coaching spots in the country. He will inherit a backfield that features likely Heisman Trophy candidate Melvin Gordon and Corey Clement. Gordon rushed for 1,609 yards with 12 touchdowns and is returning for his junior season, though he would have been one of the top tailbacks taken in the NFL Draft had he declared early. Clement, meanwhile, rushed for 547 yards with seven touchdowns in limited action as a freshman last season. Brown acknowledged it was an adjustment taking over as a coach of players he did not recruit. But the transition through four spring practices has been nearly seamless. "I think it helps out having great guys like this to work with," Brown said. "Guys that are very coachable, very responsive to you. It would be different if I walked into a room with guys who thought they knew everything and kind of objected to me trying to be forthcoming and try to help them out. But these guys are very coachable and want to be the best they can. That makes it easy for me to come and make sure I’m prepared and try to push these guys to be the best they can be." Gordon and Clement have shown they have no trouble handling carries on game day. But there are areas for improvement Brown hopes to hone. Both will be relied on to catch more passes out of the backfield in 2014. A year ago, they combined to catch two passes for 19 yards, while departed tailback James White caught 39 passes for 300 yards. Brown’s biggest goal for spring practices, however, is to help his running backs gain a better understanding of how to pass protect — to do those little things that truly help the team. "It’s the one deal that’s not natural to a running back," Brown said. "I know first-hand how difficult it is. I absolutely sucked at it when I first got to college because I was never asked to do it my whole life. We’re used to getting handed the ball and catching the ball out of the backfield, but when you’re 8 years old in the backyard, nobody asks you to pick up a linebacker. "That fundamental aspect of it, you just don’t learn. It’s totally unnatural. It starts with a mentality to first want to be good at it. I think both those guys want to be the best they can be in every aspect. So just try to make sure I do the best job I can developing them every single day and give them a fair chance to be the best they can be at that." Brown’s own NFL career was cut short by injuries. The Atlanta Falcons selected him in the sixth round of the 2008 NFL Draft, but he tore his groin after being horse collared on a tackle during a preseason game and was placed on injured reserve. He was waived the following season and never took a snap in a regular season game. Football is important, he said. But the ability to prepare for Plan B is equally valuable, and Brown is living proof — yet another lesson he plans to teach Wisconsin’s running backs. "The only reason why I got into coaching was because I wanted to help develop guys off the field," Brown said. "If you’re blessed by God to have enough talent and blessed to be healthy in the long run, football will take care of itself. More importantly, just make sure you develop yourself academically. Even if you have a chance to go play 10 or 11 years in the National Football League, you’re going to still be a fairly young individual. You better still have a plan for the rest of your life."